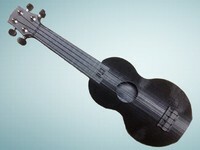 AMGP (Adapto Modular Guitar Pro) 3D Printable Guitar by RoyToreHofstad is licensed under the GNU - GPL license. 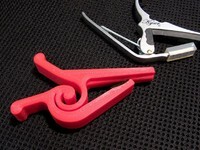 This is a 3D printable modular guitar system. As you all guitar players and guitar player wannabes know. one guitar design will never be enough. When you play on a rock concert you want to appear "hard as a rock" and use something like the "flying crotch" design. But when you come home and need to practice because you was stupid enough to say yes to play in your sisters wedding or your aunt´s birthday you know the "rock" guitar is impossible to play while sitting down in the armchair. Thats why i designed "the ArmChair" model. But when actually playing in weddings and birthdays you don`t want to bring you rock design or the stupid looking AC design. no... You want to use some boring standard design or maybe the standard grid design. this because you probably wear a suit and need to appear decent to honor your sisters big day..
To make this i used the neck electronics and vitamins from a old donor electric guitar. If my pick guard plate does not fit your electronics you can just import the blank pick guard + the desired hole punch parts in Blender and use the bolean->Difference tool to punch holes for what you want, where you want it. Same with the main body. I added multiple bodies so you can make it fit for example a fixed bridge(non whammy) if you want. To make holes to fit your bridge just punch the holes with cylinders in blender or more easily drill them out post printing. 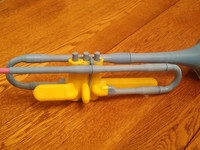 I printed all parts with only 10% infill and added rods + used only soft strings and it plays like a dream! I also added a couple of neck shim plates so you can shim the height of the neck relative to the body to suit your needs. I even added a 2->3mm wedge shim if you feel the need for that. The files here on thingie might get outdated over time. 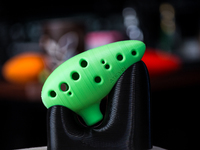 See https://github.com/rotorit/AMGP--Adapto-Modular-Guitar-Pro--3D-Printable-Guitar GitHub to make sure you got the most up to date files.